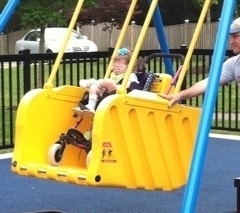 In 2010, Friends of Clemyjontri successfully raised enough money to purchase and install Virginia's first Liberty Swing, the world's first and only wheelchair-accessible swing. 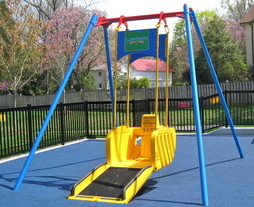 The Liberty swing automatically locks, and the ramp locks in when not in use to ensure public safety. It also features a built-in seat for those without wheelchairs but may require the safety of a seatbelt. It took the inventor, Australian Wayne Devine, ten years to develop this product. There are around 350 installations around the world, with around 15 in the USA. Other Liberty Swings can be found in Britain, Ireland, Spain, France, New Zealand and Australia, where the swing is manufactured. Come see the innovative and ecological invention that allows children of all abilities to experience joy and the recreation of swinging! *Prior to use of the Liberty Swing the user (or guardian) needs to complete a liability release. *Two keys are required to use the swing: one to unlock the gated area surrounding the swing and another to unlock the swing itself. Keys are only guaranteed available when the park is staffed (carousel is operating). If you plan to visit on a day when the carousel is not operating and you wish to use the swing, please contact the office prior to your visit at 703-388-2807 x0 to make arrangements for a key. *For users who desire to have a personal set of keys, they are provided free of charge at the Clemyjontri Park office during carousel operating hours (or by arrangement). A big thanks from the Friends of Clemyjontri to everyone who made it to the Liberty Swing Opening Ceremony held on Sunday, May 22, 2011. We had a great turn out, with heartfelt and passionate speeches from the driving forces behind the Clemyjontri dream.